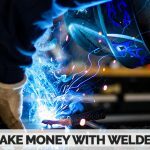 Do you want to start a hobby or career as a welder? Choosing the right welding equipment can be a challenge, especially if you haven’t yet acquired the technical knowledge to make an informed purchasing decision. As someone starting out in the world of steel construction, you need a basic, high-quality machine that is easy to use. 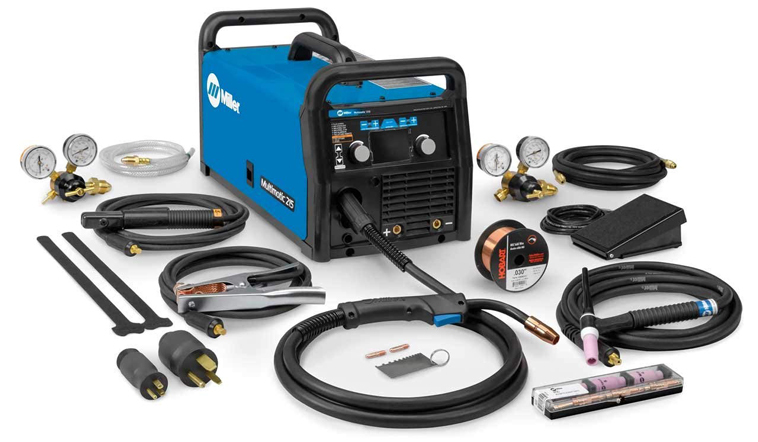 A multi-process welder may be a better option as it allows for different types of welding, for example, a model from Lincoln Electric will likely do the trick. To give you an edge, we took the liberty of researching the top welders for beginners. Our reviews are based on countless reviews and manufacturer specifications. Keep reading to find a product that is right for you. Welding is an integral part of steel fabrication and involves joining two pieces of metal or thermoplastics together seamlessly. There are different types of techniques. 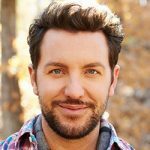 The techniques that you will be using depends primarily on the materials that you want to join, as well as the nature of your project. It is important to understand the different processes before you buy your equipment. You don’t want to buy a machine that specializes in welding, say, steel when you primarily work with aluminum. Let’s take a look at all the different processes. MIG stands for Metal Inert Gas. This is the most common industrial synthesis process and is most suitable for mild steel, stainless steel, and aluminum. Two things are needed for MIG fusion: a wire that is connected to an electrode current and a controlled supply of shielded gas. The consistent electrode wire feed that is in contact with the gas heats up the two pieces of metal to join them together. MIG machines require a direct current (DC) power source as well as a constant voltage. Stick welding is a conventional process for iron or steel welding. Arc fusion makes use of an electric current to form and hot arc between the stick and the surface of the material. This melts the metal and joins the two pieces together. Tungsten Inert Gas in combination with a non-consumable electrode heats up the base metal to create a molten weld. This is a slower and more complicated process that favors a quality standard finish and stable structure. FCAW is similar to MIG, but instead of a wire and shield gas, it makes use of a hollow wire that is filled with flux. Flux-cored arc welding is an easy process to learn and is, therefore, the best one for beginners. It is important to remember, however, that this process has a limited application range, and you should make sure that your unit can perform other welding techniques as well. Since TIG is one of the more complex techniques, it is important that you select equipment that is easy to operate. The Hobart 500551 EZ-TIG is one of the most user-friendly models available. To start the job, switch the unit on, select the type of metal, and set the thickness. 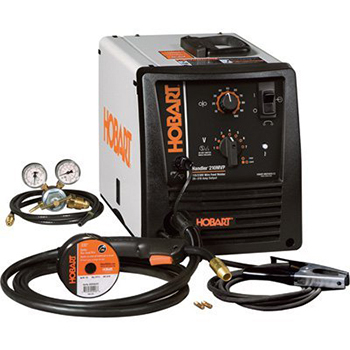 In addition to DC, the Hobart also uses AC power, which means that you can weld oxidized metals such as aluminum. You also get a wide and controllable amperage range which makes it possible to work with more material types. 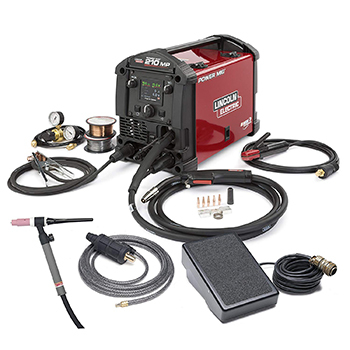 If you are new to TIG welding, this forgiving and versatile unit is just what you need. If you are new to arc or Stick welding, this unit is ideal. Not only is it easier for beginners to use, but it is also a top rated plasma cutter. As a cutter, you can use it on almost all materials, including copper, alloy steel, stainless steel, and aluminum. You get an amperage range of 15A to 200A which is wide enough to use for welding most types of steel. The unit also has an adjustable hot striking arc current which makes arc-starting much easier. It is a genuinely versatile machine, as you can use it for TIG processes as well. 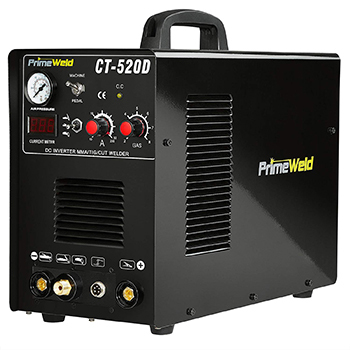 Even though the CT520D only has DC power, most reviewers agree that this unit is perfect for neat and efficient stick welding projects. 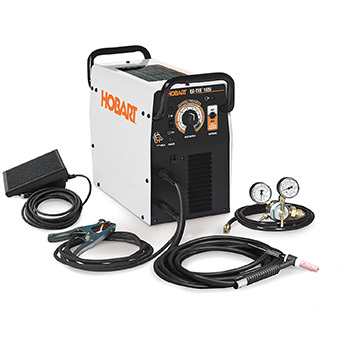 If you are an amateur MIG welder that is looking for high-quality equipment, look no further than this product from Hobart. It operates on standard 115v household current and features a 5-position voltage selector to ensure that you have complete control. What makes this particular unit great for beginners is the fact that you can select your voltage and wire feed speed. From there, the job is incredibly easy. Remember that the machine should rest for 2 minutes after every 8 minutes of use. This can be a source of frustration for commercial steel workers, but, according to reviewers, the machine works for much longer before cutting out. This is a built-in safety feature to keep the unit from becoming too warm. What Type of Metal am I Welding? The type of metal that you intend to weld is important to ensure that you buy a welder that is suited to your needs. This is especially applicable when deciding on the different processes. Let’s take a look at the different metals and the processes that correlate with them. TIG welding is by far the most versatile process. Apart from cast iron, you will be able to weld all types of metal, including ones with oxidized surfaces, namely aluminum and magnesium. In order to be able to work with as many types as possible, make sure that your TIG unit has an AC power output. High-performing TIG products typically have a wide amperage range that starts at less than 10A. Optimal performance at low amperage allows for working with delicate or thin metals. For cast iron, steel, and stainless steel, your best bet is a Stick weld process. Unlike TIG, Stick is a more robust technique that is ideal in windy conditions. When it comes to welding thick, rusty, or dirty steel, Stick is considered to be the best. For speedy steel, stainless steel, or aluminum alloy construction, opt for MIG welding. This is the easiest process the learn and since many people start off with basic steel construction, they prefer MIG to the Stick weld process. What is the Required Power Output? Generally speaking, a higher power output allows for thicker metal welding. If a product has a power output in the 100s, it may not be suited to heavy-duty or industrial welding. You will, however, be able to run it from any power outlet in your workshop. A welder with power that is more than 115v will not run from a conventional power outlet, and you may require a special setup or outlet. With DC, the current flows in one direction, and with AC, the direction alternates in cycles. With some welders, you can control the length of these cycles. Welders can provide a direct current (DC) or alternating current (AC) power output. If you can, try to find a machine that offers a combination of the two. DC has the advantage of hotter temperatures and deeper weld penetration. AC reverses the current at regular intervals. AC machines are typically more expensive as it allows for working with self-oxidizing metals. If you expect to work with thicker metals or in an industrial setting, try to opt for units with a higher output and their supporting equipment. This will prevent you from limiting yourself in terms of power. If you are, however, a casual handyman, it may be better to favor quality and versatility. Before you can draw up a budget, consider your welding requirements. The types of metal, amperage range, and duty cycle are key considerations. Also, keep power output in mind as well as additional features like amperage control. Another important aspect of budgeting for a new welder is additional equipment. Your welder may need external cooling, power, or safety equipment like a helmet and gloves. Consumables like welding wire and gas are also important to consider. When you know exactly what you are looking for in welding equipment, take some time to do research. Make sure that your requirements will adhere to your future welding needs as well. Welding machines come in different price ranges. As a beginner, it is important to ensure that you buy a durable unit with a long lifespan. A versatile unit doesn’t necessarily cost more than a specialized machine, so make sure that it meets all your welding needs. Welding consumables are the filler bond that fuses two pieces of metal together. There are four components to a weld: the metal itself, the heat source, the shield from the air, and the consumable. The metal is heated by the heat source to a temperature where it starts melting. The consumable is then added to the seam to form one piece of metal. Apart from functioning as a filler, in Stick welding, consumables also stabilize the flame an electric arc. There are, in essence, three types of consumables: cored wire, solid wire, or rod electrode. The type you use depends on the processes that your welder employs. With TIG welding, synthesis occurs due to the melted metal as you don’t add any filler material. With Stick welding, you use a rod electrode. MIG welding uses a wire consumable that a spool feeds the wire consumable to the weld joint. Many MIG units allow you to control this speed. The MIG unit for beginners has an attire range of appealing features for welders of all experience levels. First off, you can choose from either 115v or 230v, depending on the thickness of the metal. You can connect to these voltages in a twist so it will automatically find the best input power for optimal arc performance. According to reviewers, the Handler can easily weld up to 24-Ga. to 3/8” steel. Although not entirely suited for heavy-duty projects, it is ideal for automotive, home, or light industrial use. Welds 24 ga. up to ¼” steel with the Handler 140. This unit from Hobart is popular amongst novice welders as it comes with a 5-position voltage control and amperage range of 25A to 140A. With this welder, you will be able to get a stable and controllable arc as well as a neat finish. The machine runs off a 115v household current, making it ideal for DIY projects. Reviewers were impressed by its portability and the included flux-core wire. The fact that it has to rest for 2 minutes after 8 minutes of welding may be frustrating to some, but it is a safety feature that prolongs the unit’s lifetime considerably. Affordable machine for completing jobs around the house. It is a complete start-up kit that includes the unit, safety gloves, and a helmet. You also a get a grinding wheel and 0.030 DIA MIG wire to start you off. According to reviewers, this welder performs well on 20 gauge and thicker steel. The feed gun and ground clamp are durable and of good quality. Although the Forney Easy is not ideal for commercial or industrial use, the hobbyist or casual welder will find it to be sufficient. This unit is capable of TIG, Stick and plasma cutting. The CT520D is a must-have for the home workshop or small construction business as it is the ultimate in versatility. With this machine, you can weld many types of metals and plasma cut alloy steel, stainless steel, copper, and aluminum. The welder allows you precise welding and a stable arc as you can control the heat by means of a foot pedal. The DC-only output may be a disappointment to reviewers, but they were rewarded by deeper welds at much higher temperatures. 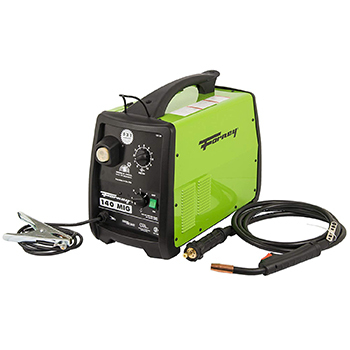 This TIG/Stick combination welder provides 200A at a duty cycle of 60 percent. It is a DC only model, which means that you get a higher weld temperature. Between these tow process, you are able to weld all types of steel, with the exception of aluminum and magnesium. The welding machine operates at 110v/220v, and you can control the inverter power by means of a foot pedal. You can also control the heat and HF start by hand. 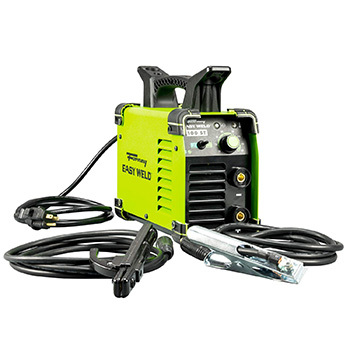 The PowerTIG 210 EXT from Everlast is a comprehensive and versatile addition to the welder’s workshop or business. This unit features microprocessor control to enhance all functions and offers both AC and DC output. This means that you can weld self-oxidized metals as well. Many reviewers found this product to be highly efficient with very few drawbacks. One problem what that the panel display may be somewhat complicated. Other than that, it is the perfect TIG welder for the beginner. The Easy Weld 298 from Forney can weld 16 gauge up to 5/16”. It is the perfect welder for the amateur or hobbyist as it is durable and easy to use. This unit has a 120v input and maximum amperage of 90A, making it ideal for automotive and household applications. 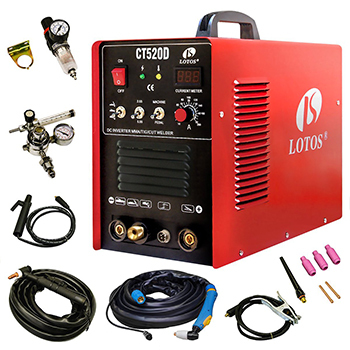 Since it is a Stick and TIG welder, you will be able to weld almost any metal, except aluminum and magnesium, as the unit only offers DC power. 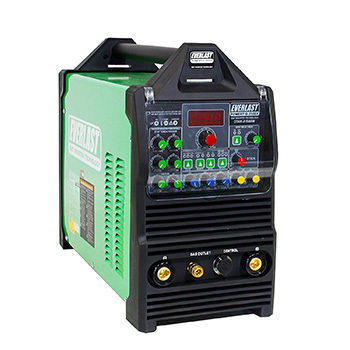 This DC inverter welder offers the operator ample control in terms of power and amperage output. This Stick machine is ideal for steel and cast iron. According to most reviews, the performance is somewhat lacking at low amperage but is perfect for thicker steel welding. If you need a welder for light industrial, household, or maintenance applications, look no further. This product from Amico is powerful enough for most steel construction projects. Learn more from our full review. 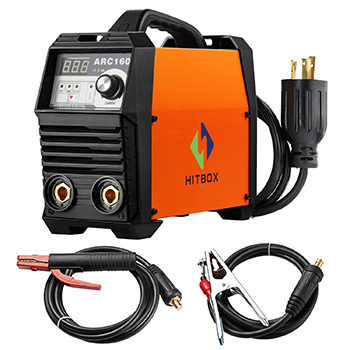 This is a highly portable Stick and TIG machine with a 220v DC output. With this unit, you get adequate digital control as well as a maximum amperage of 160A. At this amperage, you can expect a duty cycle of 40%. This welder automatically moves to the best output current to ensure an optimal arc. When the electrode sticks to the metal surface, it reduces the power output to prevent overload. Reviewers complained the 5ft welding cables were too short. Fortunately, the connectors have a standard size and allow for easy replacement. One of the biggest differences between this model and the CT520D is that this one uses a non-touch pilot arc for plasma cutting. Other than that, it also features 200A Stick and TIC welding processes. Owners of this product found it to be a comprehensive and versatile welder with a wide application range. One drawback is that doesn’t feature a built-in compressor. It is, however, an excellent welder for someone that is at the start of their welding career. The Rebel is a professional machine that offers a combination of MIG, Stick, and TIG processes, allowing you to perform a wide range of functions. You also get 120v/230v dual voltage flexibility, which means more control. Reviewers loved the stable arc and easy start that this machine has to offer. Although the quality of the foot pedal could be improved, it offers you adequate amperage control. The control you have over the output also allows you to have a neat finish. If you are looking for excellent value for money as well as unlimited functionality, Esab’s Rebel range is for you. Whether you are a hobbyist, DIY enthusiast, or professional handyman, this unit is sure to meet your unique requirements. 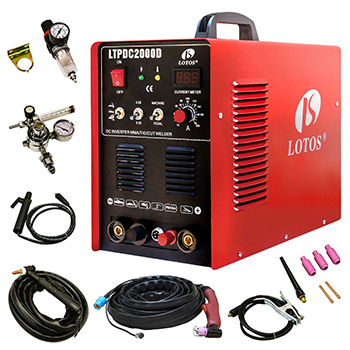 This multi-functional welder with dual 120v/230v input is easy to set up and start using. The Lincoln Electric is incredibly lightweight and portable, so you can use it anywhere, even on your roof. The processes that this welder offers include MIG, Stick, TIG, and flux core welding. Due to its amperage range, you are somewhat limited in terms of material thickness, but you will be able to weld almost any type of metal. According to reviews from welding novices, the included spool gun is durable and easy to use. 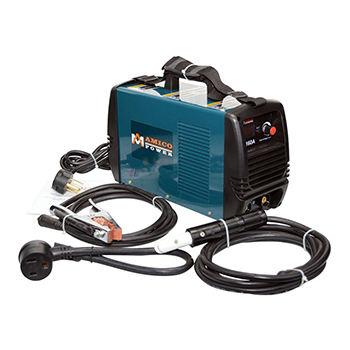 Although this unit is not suitable for heavy-duty use, it is ideal for the casual welder or beginner. This multi-process welder has a maximum amperage output of 190A. The processes include MIG, Flux-cored, Stick, and TIG. With the product, you will also receive a flowmeter and gas hose for MIG applications. 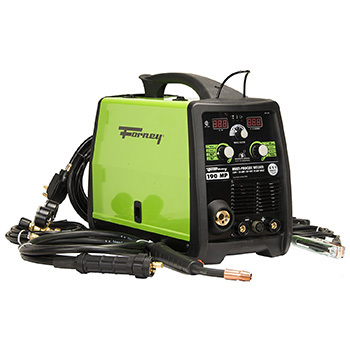 If you are beginner welder looking for something that will allow natural development of your technique, the Forney 324 is for you. This welder features a cast aluminum drive system to enhance your wire feeder. You also get a digital readout of the current output as well as the actual arc voltage. Although this unit is DC only, the multi-functionality that it offers allows you to work with any metal, excluding aluminum and magnesium. Reviewers liked the user-friendliness and efficiency of the Forney. There are many benefits to using a multi-purpose unit, especially if your welding activities expand over many different types of metal and projects. One of the biggest benefits relates to costs. Buying one multi-process welder is much cheaper than buying three or four specialized units. Such a welder also occupies less space than multiple single-process machines. 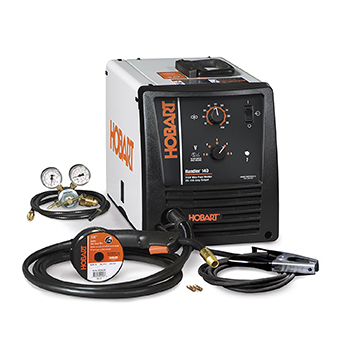 Multi-process welders are much more convenient for the hobbyist or beginner welders. They find one machine easier to learn and they don’t have to load a welder onto their dolly at the start of every project. If you are an occasional welder or beginner, you are definitely better off with a multi-process model. What Makes a Multi-Process Welder Unique? 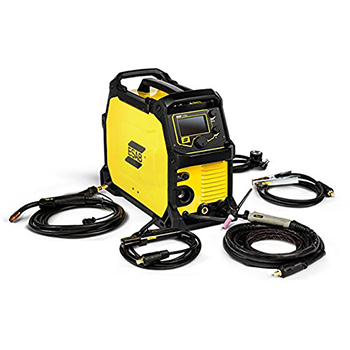 All-in-one welders, especially ones with AC output, offer a wider application range. This is because all metal types are covered by the processes, where the alternating current output makes welding self-oxidizing metals like aluminum and magnesium possible. Most multi-process welders, however, only run on DC current, which means that welding these metals is most of the time not possible. The different processes have varying degrees of difficulty, but having the all-in-one functionality makes it possible to work with single metal types that may not be possible otherwise. Unlike machines that specialize in specific processes, all-in-one welders are more suited to beginners or casual DIY enthusiasts. 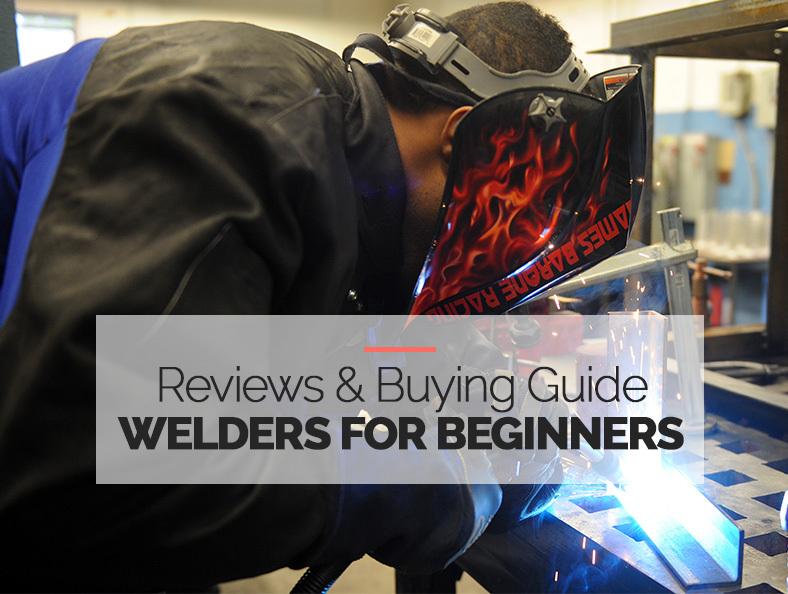 As a beginner, choosing the perfect welder may be a challenge. There are a lot of specifications and uses to understand and compare, which can make it difficult to make an informed decision. As a novice welder, you may want to stick to certain product types to ensure optimal value and use. Although TIG welding allows maximum versatility, it is not an easy technique for beginners. MIG techniques are much easier, but then you are limited in terms of material types. Beginners may be better off opting for multi-process welders, as they provide a broader scope in terms of metal types and overall use.